"Akita's Navi" is the app which easily check courses, fare, the time required and timetable, just choose departure place and destination place even if you don't type anything. It intended for the public transportation (bus / train) in Akita prefecture. 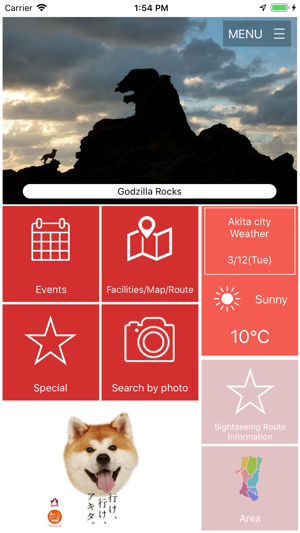 It divided into 8 area of Kazuno, Kita-akita, Noshiro and Yamamoto, Akita, Yuri, Senboku, Hiraka, Ogachi, and it can easily read the notification of sightseeing spots and events in each area. It is also possible to set facilities and event venue to the departure and destination, and search for the route. Search transfer route, time required, fare and timetable of bus and train in Akita. 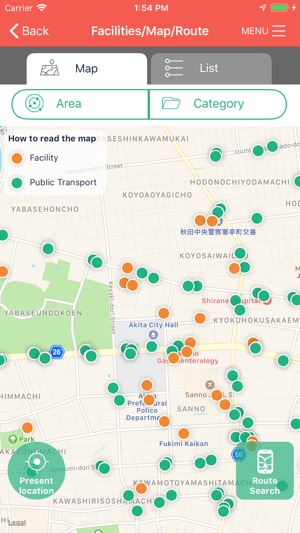 ・ Linked with location information, search present location as departure place.・Set to departure place and destination place just tap the bus stop icon or facility icon. ・Even iconless place, set from optional place. ・Set and check the date, time, departure, arrival, the first and last train or bus optionally. ・Timetable show up when tap the bus stop icon or train icon. * Shinkansen information is not covered. Provide information's of local train, local bus, shared taxi. Check the tourist facilities and event information of Akita prefecture. ・Tourist facility is shown near facilities in turn from the present location. ・Brows from “Area” and “Category” . ・Event information is shown the event which is held on the day based on the calendar. ・Browse the event and facility information which are related to each other. Search municipality's information which choose from 8 area of Kazuno, Kita-akita, Noshiro and Yamamoto, Akita, Yuri, Senboku, Hiraka, Ogachi. A game to find treasures hidden in various places in Akita prefecture. When you get close to the treasure, the app's radar informs you. Try to collect treasures while moving around Akita. © AKITA Prefecture All Rights Reserved.